ROW Members participated in the annual Azalea Sweep to clean up downtown streets by picking up trash before the Azalea Festival. The participants were treated to lunch at Husk's afterwards. 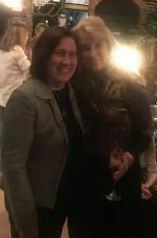 Outgoing Mayor Phoebe Bragg (on the right) introduced new Mayor Beverly Grasley at the Member Meeting on March 13. ROW members provided the food for the annual Law Enforcement Appreciation Dinner on Feb. 13 in the St. Mary's School cafeteria. Officers from the Wilmington Police Force and the Sheriff's Department attended. Staff members from the Burgwin-Wright House accept a check for $2,000 from ROW board members to construct a fence around the existing air conditioning unit. The January Member Meeting at Rolled and Baked, a new biscuit eatery on Castle St., was well attended. Nearly 80 members listened to the Wilmington Police Department, led by Chief Evangelous, speaking about the reduction in downtown crime and the problems related to homeless persons. 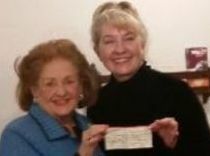 Long-time member Muriel Pearson presented a check for $5,000 to Mayor Phoebe Bragg, a gift from the estate of deceased member, June Huff. Residents in the Historic District will be impacted by decisions made by the City, County and State in the coming weeks, months and years that affect the quality of life downtown. These issues are monitored closely by ROW as explained below. The owner must buy $500,000 of commercial liability insurance. The owner must keep records of all rentals and pay the Occupancy Tax. Information about the property and the police non-emergency phone number must be posted in the house. Whole House STRs must be 400 feet from another Whole House STR or a B&B. After the first year, a lottery will be used to determine which STRs will remain where conflicts exist. A designated phone number will be distributed to report complaints to the code authorities and complaints will be recorded. If you wish to report an STR that is not abiding by these regulations, call 910-254-0900 and leave a message that includes the address of the STR. New Hanover County. The County Commissioners are reviewing proposals for a public-private redevelopment of the block that could affect the library, the Story Park, a parking garage, the Register of Deeds building and an empty parcel bordering Grace Street. Moving the Cape Fear Museum to the site is a possibility. The County Commissioners postponed a final decision on the project on April 1. III. The Cape Fear Crossing Project will determine the location of a n ew bridge between Brunswick and New Hanover Counties. The two routes that would impact the Downtown Historic District have been eliminated. Six routes south of the current Cape Fear Bridge, closer to the Port area, are under consideration. In a public hearing at the Leland Town Hall on Feb. 7, Leland residents expressed opposition to any plan that includes a new road through Brunswick Forest. They advocated a more southern route. DOT estimates bridge construction will take five years. On April 29, a public meeting will be held in the Cafeteria of Hoggard High School at 4305 Shipyard Boulevard. On open house will be held from 5:00 until 6:30. A public hearing will begin at 7:00. IV. The City has reviewed its brick street policy and repairs and restoration are underway on S. 4th Street between Market and Dock Streets; on Queen Street between S. 2nd and S. 7th Streets; and on S. 7th Street between Queen and Mears.